I fear change. I can’t help it, it’s the way I am. As far as I’m concerned there’s no music better than that of Erasure circa 1986! If an outfit is clean I’ll carry on wearing it – and when choosing a motorcycle I always go for middleweights that are within my comfort zone. But after 11 years of playing it safe I wanted to broaden my horizons, so I opted for the Triumph Street Triple RX with its claimed 104bhp, which makes it about a third more powerful than any of my previous bikes. Taking delivery of the Striple in April meant I’d have a whole summer of fun ahead, with trackdays, jaunts to the continent and daily commutes planned. I was slightly in awe at first, as it’s sportier than the other middleweights I’d ridden and, to be honest, I wasn’t sure I was enjoying it. It was time for some expert advice and MCN’s Senior Road Tester Michael Neeves suggested the source of my unease could be the suspension and tyre combination. The bike comes with Pirelli Rosso Corsa tyres as standard and firm, sporty suspension settings that didn’t suit my riding style. Michael helped me adjust the rear shock, making the ride softer, and this made a big difference to my enjoyment. I also switched to Continental RoadAttack 2 Evo tyres (£280 mail order) which I’ve found more forgiving than the Pirellis. Suddenly, the Triumph made sense. I’d planned lots of trips and days out. 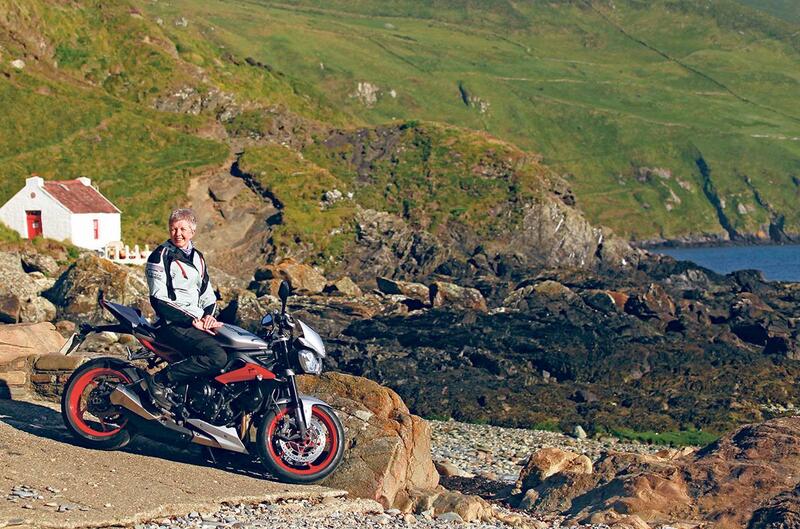 A touring holiday to the Isle of Man to explore out of the racing season was a particular highlight. The last time I’d boarded the Isle of Man Steam Packet ferry (www.steam-packet.com) was some 17 years earlier as pillion on my hubby’s Triumph T595, so it seemed apt to revisit on my Street Triple. It’s a beautiful island and, of course, I did a lap of the Mountain circuit and visited all the famous haunts, but also hidden gems such as Niarbyl Bay. It’s on the west coast and drinking a cuppa in the little café overlooking the spectacularly rugged bay was lovely. Confidence boosted, it was time to take it on track – two trackdays and one speed test. The trackdays were both very different experiences. First up was a day with an instructor from Black and White Bikes at Cadwell Park (www.blackandwhitebikes.co.uk). The second outing was with Rapid Training at Folembray in France, where they ran an open pit lane that was a bit of a free-for-all. Both were totally different but very enjoyable, giving me time on the Striple to learn more about the bike’s capabilities. My final blast out on ‘track’ was at Bruntingthorpe Proving Ground where I wanted to see just how fast I could go. My daily commute up the A1 proved that the bike can do much, much more than the speed limit, so rather than risk my licence I decided to head to the private airfield and go for it. I lost my nerve at an indicated 152mph, as my heart felt like it’d stopped beating and my mouth was as dry as the Sahara – but boy did it feel good. Happily I had an incident-free year – the only minor mishap was when I lent the Striple to one of the guys in the office and it came back without the seat hump after it flipped off. It hadn’t been taken off for weeks and had been firmly in place, so it’s one of those unexplained mysteries. Unfortunately it’s an unexplained mystery that ended up costing £125.82. What had started out as a step into the unknown ended with me being a much more confident and capable rider. I covered over 5500 miles, visited some fabulous places, met some great people and most of all enjoyed the Striple. Just goes to show the value of getting out of that comfort zone now and then. The entry-level Street Triple S is cheap, basic… and still as much fun as you can have with your leathers on. Or off, for that matter. "Adds a dynamic new dimension to the hugely popular Speed Triple"